Fort Gibson (1) (1824-1890) - A U.S. Army post established in April of 1824 by Colonel Matthew Arbuckle and five companies of the 7th U.S. Infantry in the Three Forks region of Oklahoma. Arbuckle selected a site on the Grand (Neosho) River about three miles above its junction with the Arkansas. He built a new post first named Cantonment Gibson in honor of Colonel George Gibson, Commissary General of Subsistence. Redesignated Fort Gibson in 1832. Abandoned in 1890. A few members of the Creek nation came west voluntarily in the late 1820s and in 1828 the Western Cherokees agreed to exchange their Arkansas holdings for land in present-day northeastern Oklahoma. The Indian Removal Act of 1830 marked the beginning of the forced removals of the Five Civilized Tribes. 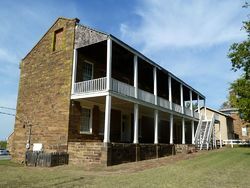 Fort Gibson was made the headquarters of the 7th U.S. Infantry in 1831. Horse troops were added to the garrison with the arrival of the Mounted Rangers in 1832. The Rangers were replaced by the Regiment of Dragoons in 1833. On 24 Feb 1833, a separate Camp Jackson (2) was established by Bvt. Major N. Young, 7th U.S. Infantry about a mile from the main post. In 1834 Fort Gibson was designated Headquarters of the Southwestern Frontier. 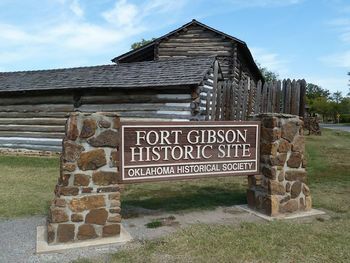 In its new role, the post renamed Fort Gibson in 1832, served as a staging area for several military expeditions sent to explore the western region and to seek peace between the Plains Indians and the resettled tribes. The most notable of the these were the Mounted Rangers Expedition of 1832 and the Dragoon Expedition of 1834. Emigrant Indians received rations, supplies, and equipment at or near Fort Gibson. Those who traveled the "Trail of Tears” by water often disembarked at the fort. During the second half of the 1830s and into the 1840s, thousands of Creek, Cherokee, and Seminole stopped at the post on the last leg of their journey to the new lands. The Army’s mission was largely over by the early 1840s but Fort Gibson continued as an active post until 1857, when the troops were withdrawn and the buildings and land were turned over to the Cherokee Nation. At the start of the U.S. Civil War, the post was occupied by Confederate troops briefly, before they established Fort Davis (1) across the Arkansas River. 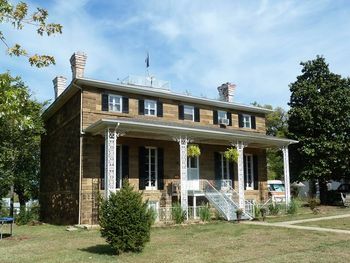 Federal troops reactivated the fort in 1863, renaming it Fort Blunt in honor of General James C. Blunt. It served as the Union Army’s key post in Indian Territory. It also became a haven for thousands of pro-Union refugees. Confederate forces tried to take the post in 1863 but were stopped near the town of Checotah, at the Battle of Honey Springs. The Army stayed through the Reconstruction period while the Indian wars were being waged in the western part of Indian Territory. Troops from Fort Gibson rebuilt Fort Arbuckle and established Fort Sill (1) to provide the Army with more effective bases in the west. In 1871, most of the garrison was withdrawn and the post was redesignated a commissary supply post. As railroads entered the Territory, a large number of outlaws, squatters and other undesirables followed. To keep order, Fort Gibson was reactivated in 1872, and troops remained throughout the 1870s and 1880s to help keep order and to guard against intrusions on Indian lands. With the closing of the frontier, Fort Gibson was no longer needed. The post was closed in 1890, and its land and buildings sold. Beginning in the early 1920s, local residents sought to preserve Fort Gibson’s History. In 1936, the stockade area was reconstructed by the WPA and the Fort Gibson Stockade Commission. 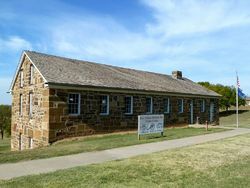 Today, the Site is a National Historic Landmark, operated by the Oklahoma Historical Society. in the eastern part of the state. It is a few miles northeast of Muskogee. Roberts, Robert B., Encyclopedia of Historic Forts: The Military, Pioneer, and Trading Posts of the United States, Macmillan, New York, 1988, 10th printing, ISBN 0-02-926880-X, page 654. Hart, Herbert M., Tour Guide to Old Western Forts, Pruett Publishing Co., Boulder CO, 1980, ISBN 0-87108-568-2, page 123. Frazer, Robert W., Forts of the West, University of Oklahoma Press, Norman OK, 1965, ISBN 0-8061-1250-6, page 120. This page was last modified 17:30, 13 March 2019 by John Stanton. Based on work by Bill Thayer.